Thanksgiving always invokes feelings of warm fuzzies for me. Other then the delicious food, it always reminds me of family. Growing up, I can always remember my family gathering around grams table to eat, meanwhile I was stuck at the kids table with the other kids in the family, though I think I spent more time on my mom or grandmas lap then I did actually sitting at the kids table. Any time the family got together it was a time of love and most of all laughter, I can’t recall how many times I would see my grandma laughing so hard she was crying, and the great thing is, this tradition continues on, there are very few times that the Mason Jar Mamas (Carol, Dawn & April) gather that doesn’t end up at some point with one of us laughing so hard we are crying. Even when Mama Carol was going through Chemo for Breast Cancer, she battled with humor (I believe it was her ability to find her laughing place that gave her the strength to survive. Anywho, with the growth of followers we’ve had recently, I wanted to use today to start a Friday Night Link Party. 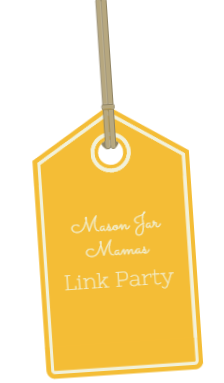 Each Friday we will have a link party which will stay open all week. Follow the theme listed and feel free to start posting! This Week our theme is : Thanksgiving Recipes, Decor Ideas, & Crafts (this includes printables such as coloring pages as well).